Mankind’s desire to improve on nature probably goes back to our beginnings as a race. Certainly attempts to improve the color and clarity of gemstones date back to very ancient times. Early writers describe the use of intense heat along with dyes, acids, oil, wax and other means to alter and improve the value of gemstones. As technology and scientific understanding have improved over the centuries, so has the sophistication of gem treatments. Cleopatra’s famed emeralds were undoubtedly oiled to improve their color and hide imperfections. Today emeralds are not only commonly oiled but sometimes enhanced with dyes, epoxy resins and other high-tech substances to hide or strengthen internal fracturing and improve color. 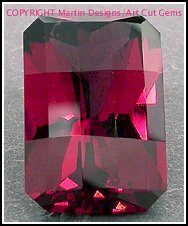 Beautiful natural stones like garnet and spinel are presently free of any known kind of treatment. Real garnets are not yet made in laboratories either. Demantoid garnet is sometimes mildly heated to improve color but that's the only garnet treatment that's known. We made a conscious decision to specialize in selling untreated gems when they are available so we can honestly represent them to our customers as completely ‘untreated and unenhanced.’ Where treatment is known or suspected we note it in our descriptions. (See the chart below for a key to our codes). High-tech treatments of other gems are now are commonplace, especially rubies, sapphires and topaz. Some involve simple heating to high temperatures to improve color and eliminate certain kinds of inclusions. Opinions vary about heat treatment and how it should affect value. Colorless topaz is irradiated to turn it blue and with careful U.S. government inspection the treatment is safe and permanent. Topaz is also subjected to several other treatments including various types of coating, diffusion, etc. Some sapphire treatments are very controversial like a process called beryllium bulk lattice diffusion. Originally this treatment, which introduces a foreign substance into the sapphire, resulted in only orange-to-padparadscha colors. Researchers have now confirmed that blue sapphires are being beryllium-treated as well. We do not sell beryllium-enhanced stones or any others resulting from serious alterations to the natural material. We offer many totally untreated sapphires with written third-part gem laboratory verification. Some of our sapphires have been given low heat treatment only, a practice universally accepted in the gem trade. We always note such treatments in our descriptions. We sell no synthetics, ‘cultured’ or other man-made imitation stones of any kind unless a customer specifically requests them. All known gem treatments current to 2004 are listed in the table below. We will update the list as new information becomes available. Each gem in our listings has a code that corresponds to symbols in the table, as well as a use code that designates whether it’s suitable for use jewelry. A typical code might read: (All uses, Eh), meaning: Suitable for all uses; normally Enhanced, by heat. "Enhancement" - any traditional process other than cutting and polishing that improves the appearance (color/clarity/phenomena), durability or availability of a gemstone. The “N” symbol is used in our stone descriptions to indicate gemstones not currently known to be enhanced (alexandrite, nearly all garnets, Moonstone and many others) or gemstones that can be proved not to have been enhanced in any way. An “E” indicates the gemstone has probably undergone a traditional enhancement procedure. Many enhancements are difficult or impractical to prove. We assume gems so marked have undergone some type of enhancement. B = Bleaching: The use of heat, light and/or chemicals or other agents to lighten or remove a gemstone's color. C = Coating: The use of such surface enhancements as lacquering, enameling, inking, foiling, or sputtering of films to improve appearance, provide color or add other special effects. D = Dyeing: The introduction of coloring matter into a gemstone to give it new color, intensify existing color or improve color uniformity. F = Filling: The filling of surface breaking cavities or fissures with colorless glass, plastic, or some similar substance. This process will improve durability, appearance and/or add weight. H = Heating: The use of heat to alter color, clarity, and/or phenomena. HP = Heating and Pressure: The use of heat and pressure combined to effect desired alterations of color, clarity and/or phenomena. I = Impregnation: The impregnation of a porous gemstone with a colorless agent (usually plastic) to improve durability and appearance. L = Lasering: The use of a laser and chemicals to reach and alter inclusions, usually diamonds. O = Oiling/Resin Infusion: The filling of surface-breaking fissures with a colorless oil, wax, resin or other colorless substances, except glass or plastic, to improve the gemstone’s appearance. R = Irradiation: The use of neutrons, gamma, ultraviolet and/or electron bombardment to alter a gemstone’s color. The irradiation may be followed by a heating process. U = Diffusion: The use of chemicals in conjunction with high-temperature heat treatment to produce color change and/or asterism-producing inclusions. W = Waxing/Oiling: The impregnation of a colorless wax, paraffin and/or oil in porous or translucent gemstones to improve appearance.